An explosion of California poppies in the hills surrounding a Southern California town has attracted “Disneyland-size crowds,” forcing city officials to close the wildflower-viewing area. The city of Lake Elsinore declared the situation “unbearable,” shutting off access to Walker Canyon and canceling shuttle service as a massive traffic jam developed. The city initially shared a message on Saturday, discouraging people from coming to the area as traffic on Interstate 15, that passes by the Riverside County town, stopped moving. But throngs of wildflower-obsessed tourists continued to descend on the area, leading to a complete shutdown. Rain is a key ingredient in the recipe for spectacular wildflower displays. 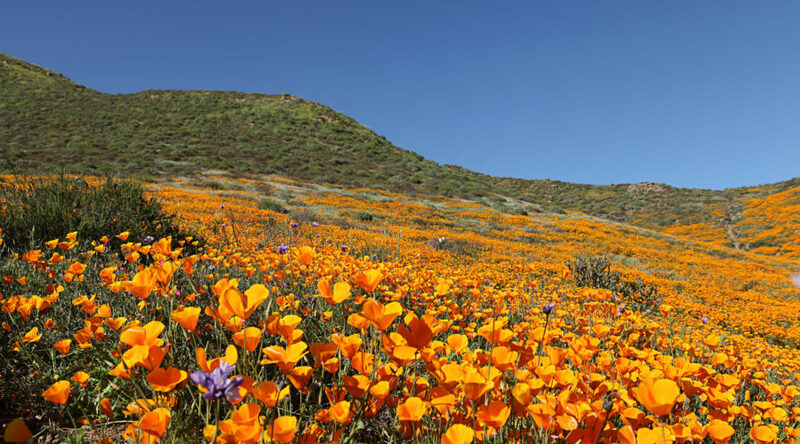 Amid a winter marked by strong storms, botanists predicted wildflowers would pop up across the state, especially in Southern California, because the desert landscape has fewer invasive plants and grasses that push out wildflowers. The bloom started the last week of February, and now the hillsides are carpeted in velvety orange. Photos of the display flooded social media, and Reinig says the county posted signage encouraging shutterbugs to tread lightly around the flowers. The super bloom was originally met with excitement in the community, which is about a 90-minute drive from both Los Angeles and San Diego. But problems began surfacing, including people leaving trails and trampling flowers.